Applications like cryptocurrencies and ICOs create confusion about the technology, economist Jason Schenker says. Blockchain technology has the potential to drastically improve data sharing and reduce the risk of a central point of failure in logistics operations, according to a new book by Jason Schenker, an economist who specializes in the material handling industry. Despite that promise, the technology faces many challenges to its adoption, such as an excess of hype and confusion driven by its applications for complex concepts like cryptocurrencies and initial coin offerings (ICOs), says Schenker, who is president and chief economist at Austin, Texas-based Prestige Economics LLC. At its core, blockchain creates a distributed ledger of information that can be read by all the members of a particular group, but can never be changed by a member acting alone. Whether it's used to track logistics transactions or to support digital money like bitcoin, the technology allows trading partners to share access to permanent, secure databases. 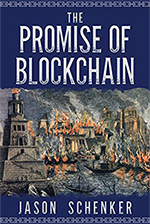 Those attributes could create significant improvements in efficiency for supply chains, transportation, logistics, freight, and material handling, as well as creating opportunities in other fields like healthcare, agriculture, real estate, finance, and government, Schenker writes in his book, "The Promise of Blockchain: Hope and Hype for an Emerging Disruptive Technology." Common supply chain tasks that show great potential to be improved by blockchain solutions include record keeping and the handling of chain of custody of ownership, which are critical practices in any business, Schenker said in an email. "The impact on corporate supply chains — on logistics, transport, and freight — is going to be massive," Schenker said. "After all, blockchain allows for a permanent distributed ledger, and if used in a private, commercial endeavor, it could provide instant transparency of origin, content, and custody, which is often required from a regulatory framework for conflict minerals, chemical content, or trade." That data transparency can also add value in public health and safety, in applications such as agricultural products and food safety, he said. "Blockchain can improve transparency of goods transport and freight. And it can allow for greater ease in transactions that rely on antiquated documentation processes in industries that are ripe for disruption," said Schenker. Schenker's book comes at a time when companies in seemingly every corner of the logistics industry are joining initiatives to provide blockchain education and to develop standards for its applications in freight and transport. One trade group, the Blockchain in Transport Alliance (BiTA), has hundreds of members including major names like GE Transportation, BNSF Railway Co., UPS Inc., FedEx Corp., SAP SE, McLeod Software Corp., and Trimble Inc.
Other firms are beginning to launch blockchain platforms for real-world applications, such as the joint venture created in January by Maersk Line and IBM Corp. to apply the technology to their global trade and transportation practices. FedEx is also testing blockchain for tracking high-value cargo, the firm said in May. Feedback: What did you think of this article? We'd like to hear from you. DC VELOCITY is committed to accuracy and clarity in the delivery of important and useful logistics and supply chain news and information. If you find anything in DC VELOCITY you feel is inaccurate or warrants further explanation, please ?Subject=Feedback - : Book: logistics firms must look past blockchain hype to see its potential">contact Chief Editor David Maloney. All comments are eligible for publication in the letters section of DC VELOCITY magazine. Please include you name and the name of the company or organization your work for.